Below is the current list of dogs needing homes or rescue. Click on the dogs picture or ID# to see more information and a larger photo. To see more of the list move your mouse so that it is over the list and rotate your scroll wheel or click on the down arrow at the bottom right of the list. 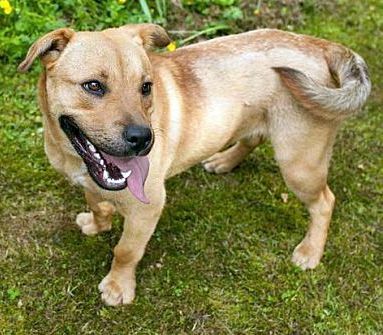 This unique boy is thought to be a Labrador mix. He has a short stocky body and a big head. Squirt is 4 years old and approximately 35lbs. He has lots of personality and loves people. Squirt MUST be the only pet as he is not good with dogs or cats. If your looking for lots of love in a short, stocky package then Squirt may be just what you are looking for. This little man is lots of muscle in a short body so would do best in a home without small children. Fenced yard required, 6ft preferred. Squirt is neutered, current on shots, heartworm negative and microchipped. Sorry but he is not a good choice for apartment living! Questions can be emailed to his foster mom Janet via the link below. If you are interested in adopting Squirt please e-mail jrmoncure@aol.com or phone Hickory Hill Canine Rescue on (804) 537-5502 9am-9pm to find out more about this dog. Rainbow Animal Rescue NC is a non profit 501(c)(3) organisation that rescues and finds homes for unwanted and homeless puppies, dogs, kittens and cats from their center in Halifax, North Carolina. If you are in southeastern Virginia please click here to see puppies and adult dogs needing homes. WARNING: Not all dogs at the shelter are listed on the facebook page. If you have lost your dog go to the shelter to check. Dogs collected by the Bland County dog warden are taken to Wythe County Dog Shelter. If you have lost your dog, go to the shelter because the shelter staff 'may not recognise your description of your dog'. You only have 5 days to claim your dog. Have your dog microchipped and make sure your contact details are up to date so that ownership cannot be disputed. It may save your dogs life! We welcome enquiries from potential adopters and animal rescues. 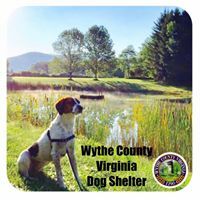 If you are not a resident of Wythe County or one of the adjacent counties, contact your local rescue to see if they will rescue the dog for you. Please phone about a specific dog rather than e-mail which may not be read in time. For information regarding the dog featured, please contact Wythe County Animal Control NOW on (276) 228-6003. We keep stray dogs 5 days so that the owner can claim them but you can express an interest before the 'available' date. The date the dog is listed as 'available' is NOT the day it will be put down but we may only keep the dog for 5 days after the 'available' date. Once we have found these dogs homes or rescue places we can then rescue more dogs from death row at the pound. Giles County Animal Pound is a small rural facility in the southwest of Virginia. While Giles County Animal Pound is not yet a no-kill facility, this is a goal we strive to achieve each and every day. For more information see the Giles County Animal Control website. We are 8 miles from Pearisburg. Please call the shelter at 540-921-2053 to verify that someone will be at the shelter. We adopt animals out to citizens of Pulaski County, VA, surrounding counties, and other areas that are not too far away. The Pulaski County Animal Shelter and Humane Education Center is the official Animal Control shelter for Pulaski County, Virginia. Animal Control is responsible for ensuring that the community is safe from problematic animals and also to ensure that the animals are safe from abusive owners. Animal control only handles domesticated animals such as dogs an cats. The shelter is also shared by the Pulaski County Humane Society. URGENT: If you are interested in an animal at Pulaski County Animal Control, you must act immediately. Virginia state law only requires an animal to be kept for 5 days. Adopting a dog from Pulaski County Humane Society will make room for another dog held at Pulaski County Animal Control. The Russell County Animal Shelter provides a comfortable, warm and safe environment for the animals we receive who are unwanted, abused or abandoned. We provide adoption services for animals with suitable dispositions in an effort to place them within a nurturing environment. We believe that shelter animals can be placed into a loving and wonderful family environment. If you are interested in animal adoption, please contact the Russell County Animal Shelter at (276) 415-9163. Greensville County Animal Shelter is a small rural facility in the south of Virginia. While Greensville County Animal Shelter is not yet a no-kill facility, this is a goal we strive to achieve each and every day. We are also fortunate enough to work with some amazing rescue groups and dedicated individuals who help us move animals to safety each and every week. If you need an earlier/later time, please call Doris on 434-632-1681 to make arrangements. She is more than willing to work with you if she has time to plan ahead. We are the Animal Shelter for the City of Richmond, Virginia. The Humane Society for Campbell County in Rustburg, VA is always overflowing with wonderful dogs. It currently has a number of owner surrenders that need loving homes, as well as dogs in the pound that need help. Please see click here for a full listing. The Adoption Fee varies from animal to animal and will depend on the amount of care given to the dog. Care includes, but is not limited to: spay/neuter, vaccinations, heartworm testing, deworming, treatment with Frontline, special vet care, microchipping, temperament-tested dogs who have been in foster care, house training, grooming, and socializing. Some dogs are in foster homes. While these dogs are not in danger of being PTS, moving one into rescue frees up that foster home to take another dog in need! Vetting: All dogs are dewormed. Other vetting offered at cost that shelter pays; please contact nomordogs@yahoo.com for a quote. Humane Society for Campbell County, Inc.
We are a small animal rescue organization that was started in the winter of 2004-2005 by veterinary students in Blacksburg, Montgomery County, Virginia. We have our corporation status and we are in the process of applying for our non-profit status. There is certainly an incredible need for animal welfare and rescue organizations down here in Southwest Virginia. We have adopted out over 80 animals in our first nine months. We are strictly comprised of foster homes and we take in dogs, cats, small pets and the occasional horse! Out of time dogs are in immediate danger of being destroyed. All stray dogs taken to the shelter have a 7-day period of grace, after which Virginia State law dictates they can be euthanized (those with collars get 10 days). Surrendered dogs (those with names in our list) can go any day. The shelter works very hard to find adopers or rescues as quickly as possible. A sudden influx of dogs can fill the shelter overnight and leave the staff with no choice but to remove dogs who have been held beyond the required period. We'll put a special note on the bios for those dogs whose stay at the shelter has become one on death row. Please do not call to complain about dogs being euthanized. This is the HARDEST task the shelter staff have. They feed and pet and play with these dogs daily, but there are too many dogs, not enough homes, and not enough money (especially in a rural county like Westmoreland). They do their absolute best to get these dogs into loving homes or responsible rescues, and they want to take as few as possible to the vet for humane injection. If you do not like healthy dogs being killed then do something about it by referring your friends to the Westmoreland shelter to adopt, and advertising the dogs at the shelter and volunteering to transport the dogs to rescue organizations. The pull fee is $20 but can often be waived if the dog is due for destruction. Dogs will get their DHPP shot and will be wormed before transport. Additional vetting is usually available but must be paid for by receiving rescue. The adoption fee itself is $20. The shelter is open from 12-3 pm on Wednesday and Saturday and from 12-5 pm on Friday. Please call Dale Berry or Tommy Hamilton at 804-493-0869 if you have any questions about the dogs, the adoption procedure, or shelter policies. Please be sure to call before driving to the shelter to be sure the dog is still available for adoption. A volunteer westcoshelter@hotmail.com can answer e-mail queries, but this person is not at the shelter and is not directly involved in the adoption process. Pound Pals works in partnership with the City of Radford Animal Shelter. The mission of Pound Pals of Radford, Inc. is the prevention of suffering, neglect, abuse, and cruelty to animals by working in conjunction with our local animal shelter in all phases of animal placement and rescue. Pound Pals of Radford, Inc. is a private, non-profit 501(c)(3) organization. We receive no public funds and rely on tax-deductible donations to help abandoned animals. Contributions help pay for the animals' medical needs as well as for spay/neutering. There is more information about us on our website here. If you are interested in one of these dogs please contact Pound Pals at pals@psknet.com or fill in the adoption application form here. Pound Pals of Radford, Inc.
Rockbridge SPCA is such a wonderful shelter to work with but they are full and they need help moving these dogs ASAP. 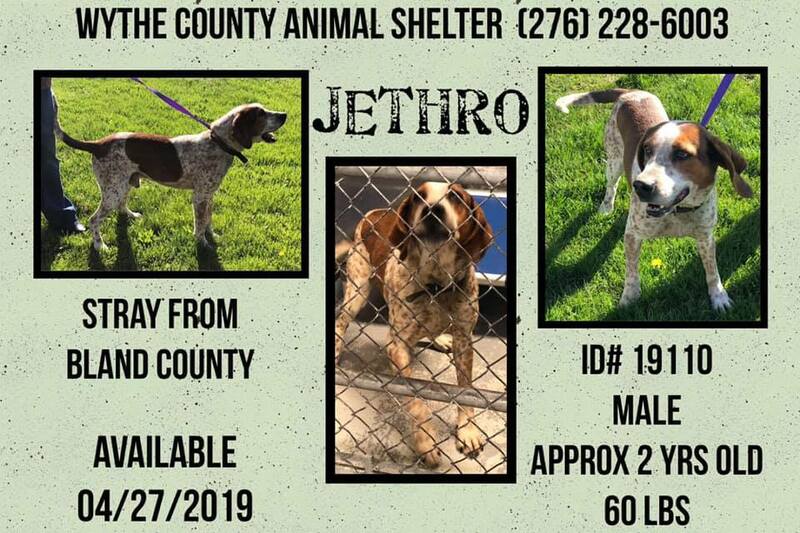 If you can help please phone the shelter on 540-463-5123 during working hours or email ksgreys@ntelos.net Shelter is rescue friendly; pull fee varies but animals can be vetted for around $50. The dogs and cats are all UTD on shots; many are altered. If you are interested in saving one of these pets but you cannot take it immediately, try your local rescue as they may be able to pull it for you. The Louisa County shelter is FULL and these wonderful dogs and cats are in need of rescue help. If you can help, please phone 540 894-4219 or email lcpound2000@yahoo.com The shelter is always filling up so animals need to be spoken for quickly. They can be held while transport is arranged and transport help is usually available. Pull fee is $20 and includes a rabies vaccine if the animal is old enough. See the list at the Petfinder website here. Click here for more dogs and cats needing homes. Mature 13--17 years old are welcome ONLY on Saturdays with a parent or guardian willing to supervise. Willing to work hard while at the shelter. Willing to clean as directed. Willing to get along well with people in charge, other volunteers, and the public. Dependable – come when you say you will. MUST NOT BE: Afraid of either dogs or cats. Afraid of getting dirty from the animals. Afraid of seeing injured or sick animals. MUST: Understand the importance of spaying and neutering and responsible animal ownership. Understand the Shelter phone is for business use only. Southside SPCA is a no-kill, non-profit animal shelter in south central Virginia, serving 12 counties, and we are run entirely on donations. We are located 60 miles west of Richmond in Prince Edward County. We provide love, humane care and shelter for abandoned animals and strive to provide them with loving, responsible homes. We always have many wonderful dogs and cats available for adoption. To see some of our animals, please click here, or stop by and visit us if you're in the area. Our hours of operation are 8am-12pm and 1pm-4pm Monday through Friday and 9am-12pm on Saturday. We are closed on Sundays. To give animals entering our shelter their best chance of finding a forever home, we work with many rescue organizations across Virginia. These rescue groups assist us by taking animals from our shelter and placing them in loving homes. Please view our page and let us know if you can help find a pet a home. The dogs with the lowest numbers have been there the longest. If you are local to Page County and would like to make a donation, we are always in need of dog food, cat food, toys, towels, rags, cleaning supplies, etc. If you live anywhere in the USA you can make a monetary donation to the Animal Shelter, but you must make the check payable to: Page County Animal Shelter. Reference: Shelter Supplies on memo line. How close are we to you? Click on this link and put your town and state or zip code in the box at the bottom of the page then click on the Get Directions button. The Floyd County Humane Society and Floyd County Animal Shelter are overflowing with dogs and need help ASAP! The shelter is a gassing shelter and the Humane Society pulls and holds dogs for transport so we can get them rescue help. With both full we cannot save any more of the dogs headed to the gas box! If you can help ANY of these dogs please call the Pound on 540-745-9365, Hours 8-9am and 2:30-3:30 pm. The shelter only holds dogs for a few days (state minimum and that is it usually) and we desperately need to move dogs. The adoption fee is only $10 and the Floyd County Humane Society will donate $50 towards the cost of the required spay/neuter. You must be a resident of Floyd or an ajacent county to adopt. If you are not local contact Floyd County Humane Society on 540-745-7207 and tell them what dog you are interested in. The Floyd County Humane Society will arrange the adoption with you by taking ownership of the dog. So you will be adopting from them, instead of the dog pound. You are welcome to call them at 540-745-7207 and to discuss the details. Directions to pound: From Rt 8 south, bear left onto Storkers Knob Road (Animal Shelter sign) and go uphill until you come to driveway called "Pound Road" OR go a little further to the large gate of the Floyd Transfer Station, and make a sharp right; pound is behind blue metal building. All of the dogs listed are URGENT. These are the most urgent but everyone is running out of time and needs help ASAP. I am arranging transports so if you are interested in any of the dogs and need transport help PLEASE let me know! If you are interested in becoming one of our approved rescues you would need to contact our Rescue Coordinator, Beate Begley, at bbegley@pwcgov.org or by phone at 703-792-5168. She will need a copy of your 501c3 paperwork as well as your adoption contract and some other information.